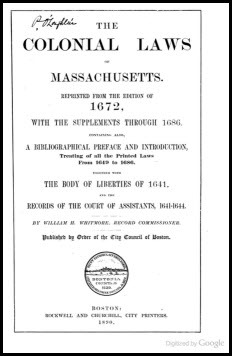 You can’t be a genuine law geek without breaking into a smile when you discover that one city, in one state, reprinted an entire body of its earliest colonial laws — and included a whole introduction outlining the known sources of manuscripts used. And you can’t be a genuine law geek without breaking into a happy dance when you discover that the reprint has been digitized and is online, free. Maybe those things don’t interest you. But as for The Legal Genealogist…? I may not be a lawyer, but I’m with you. These old law statues are fascinating. Love reading these sorts of historical items. They really are wonderful resources, and help tell our ancestors’ stories! So how bad was a pillory if two hours in one was as bad as 2 months in prison? Pretty darned humiliating, to be out there in front of everybody! I wonder if it is in Public Library as well? Must check. Up for air. It really is fascinating. Right off the bat, I learned that sizes and amount of wheat flour in loaves of bread were regulated and, each loaf had to have a mark identifying who made it. Is that cool or what? And if a merchant screwed up and a batch had to be confiscated, the agent got 1/3 and the rest went to the poor. Sure helps to get a feel for life. I can almost smell the bread, and see the loaves being carefully partitioned and weighed. A goodwife or her servant putting a loaf into her basket. I love stuff like this.